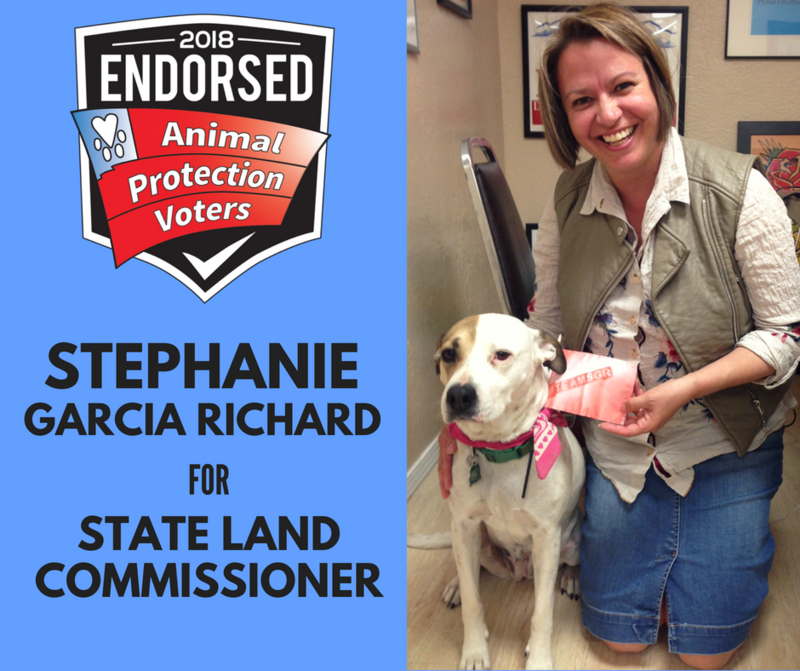 SANTA FE, N.M. – Animal Protection Voters, via its political action committee APV-PAC, announced today its endorsement of Representative Stephanie Garcia Richard for State Land Commissioner in 2018. As the authority who controls the use and care of 9 million surface acres of state trust land in order to fund childhood education and other public institutions, the State Land Commissioner is in a powerful position to protect New Mexico’s wildlife residing on those lands. Stephanie Garcia Richard’s tenure in the state legislature reflects a deep commitment to caring not only for the health of New Mexico’s land, communities, and animals, but also for the education and wellbeing of New Mexico’s children. As a state legislator, Rep. Garcia Richard has earned a 100% lifetime score in the Animal Protection Voters scorecard. She sponsored legislation in 2017 that would have prevented black bears and other wildlife from being unnecessarily killed by state agencies. She also voted in 2013 to ban cruel coyote killing contests across the state. If elected as State Land Commissioner, Rep. Garcia Richard is the only candidate that has committed to unequivocally banning dangerous leg-hold traps and lethal poisons on state trust lands. She is also the only candidate who will ensure wild horses have a sustainable place on public lands. Garcia Richard also brings with her a strong vision for transforming the State Land Office into a modern agency that forges new partnerships and adopts up-to-date technologies to make data-based decisions regarding land use that may impact wildlife, habitat, outdoor enthusiasts, and other land users in order to guarantee both sustainability and optimal funding for education. Animal Protection Voters/APV-PAC issues endorsements based on candidates’ records and positions on animal protection issues and not based on party affiliation. For more information about Animal Protection Voters’ accomplishments, current priority issues, and annual scorecards, please visit www.apvnm.org, and be sure to follow Animal Protection Voters on Facebook and Twitter. APV-PAC is the only political action committee in New Mexico dedicated solely to electing humane state lawmakers that support animal protection. Follow APV-PAC on Facebook to stay updated on its election work throughout the state.